My Mum is of the age where she was a child during the Second World War. She therefore had it drummed into her that waste was wrong, and you should eat what was put in front of you. I suppose I was therefore bought up with this attitude, and often remember getting in trouble because I refused to eat something that was on my plate – including at school where the headmistress sat me on her lap and forced mince into my mouth, to this day, I still can’t eat mince, and I’m not sure if it is I still don’t like the taste or the awful memory of what would not be allowed to happen these days. M is fussy eater, and we have to be rather careful introducing new foods to him. It often seems we eat the same half-dozen meals because they are things I know he will like, but I know this isn’t really the case. As he has grown up, he is less bad, but still views new foods with great fear, and so I often get him into the kitchen to help so he can see what has gone into the dish as things he likes and I’m not trying to poison him! At the weekend, we often have a treat to eat, and I will bake a cake or cookies, and I often ask the children what they would like – it saves waste if they have chosen, as I know it is something they are in the mood for. They will often choose muffins, and I have quite an array of recipes that I use. I think muffins are a great way of getting fruit into the boys without them really noticing. M will not eat bananas, he just doesn’t like the texture – something I understand as most of the foods I dislike are texture related. However, he will eat a banana muffin without complaint – as long as I don’t tell him they are in it!! It does however seem that it doesn’t matter how much they want something, there are always leftovers. I am sure they almost do it on principle. This is where Waste not Pudding comes in. It is basically bread and butter putting, but instead of using bread, I use left over cake. 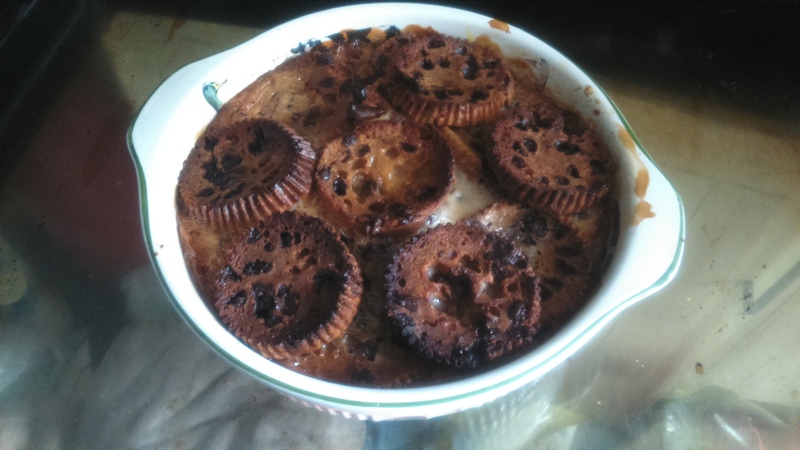 It always goes down really well with everyone – except me who doesn’t like a baked milk pudding! I just slice the stale muffins, or doughnuts, or cake, and arrange in a greased oven proof dish. How stale and what type of cake dictates if it needs anything added, for example a plain muffin or cake, might need a little jam spread on it, but one with chocolate chips or sultanas is fine just sliced. I suppose it would all be personal preference. For the amount of cake equivalent to 5 slices of bread, I use 1/2pint milk whisked together with 1 egg. I don’t usually add any form of sweetening, but it is up to you. I pour the milk and egg mixture over the cake and allow it to sit for at least 20 minutes, pushing it down every now and again to make sure it soaks in evenly. It is then baked at 180c for about 45 mins. Everyone thinks you have worked hard at making a nice pudding, but in fact you are just not wanting to feed the stale cake to the birds!